Please make sure to click on the main link to each site where it's provided. I've highlighted items that stand out to me to purchase but many of these companies have some unique items you won't find in just any store. I got a bit lazy and didn't put photos in because it was getting overwhelming for this blogger so just click through the link if you're interested in taking a peek at the items plus that way you get more photos and a full description and cost. Hoping this is a help to you this Christmas season! As you shop their sites below there are some great options for teen girls on your list too. Keepsake Kitchen Diary from Lily & Val (I bought this for myself and haven't started it yet but hope to this Thanksgiving). It's a beautiful keepsake that will be passed on for generations in your family. Great gift for yourself or your mother or grandmother too! 2018 Yearly Prayer Journal & Undated Prayer Journal from Val Marie Paper (I have and use the undated prayer journal to keep in my purse always – love it!) The yearly prayer journal is on my wishlist. GraceLaced Book by Ruth Chou Simons is a gorgeous book but more than that it is a seasonal devotional book deeply rooted in God's promises. This is a beautiful gift for any woman on your list. Give Me Jesus Journal & It Is Well With My Soul Mug from Well-Watered Women. So many things to love at their site. 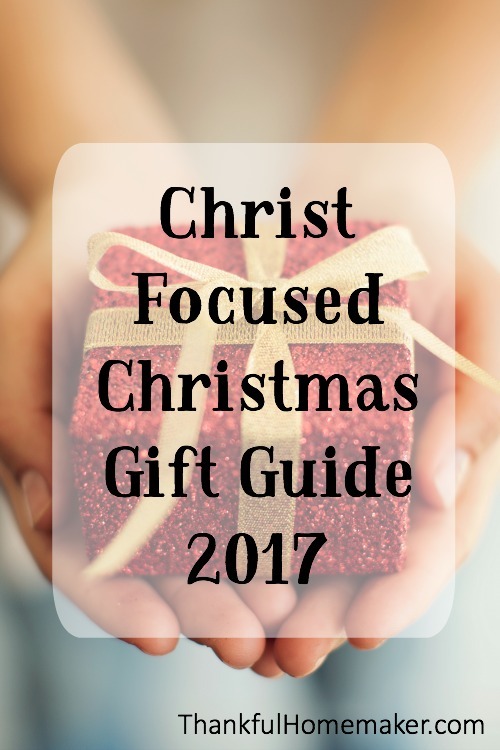 Great gift ideas for so many on your list! Verse Cards & Redeemed Bracelet & The Daily Grace Scripture Memory Journal from The Daily Grace Company are just a few of my favorite things! Focused 15 Bible Studies from Katie Orr look like a great gift for your women friends. I first heard of Katie through this year'sHomemaking Ministries Conference. You will love and blessed by her resources. Maybe one in your stocking! Anchored Press Daily Devotional Planner from Anchored Press. I just ordered this for myself because I am a planner junkie and wanted a change from my iBloom planner for 2018. The Homemaker's Friend Daily Planner is a great resource for any woman on your list who needs a planner. It covers everything you need at a great affordable cost too. ESV Systematic Theology Study Bible from Crossway. This is a great resource. If you get it for your husband you will benefit too! ESV Family Devotional Bible from Crossway. This is a great tool to help your husband (or son or son-in-law) to lead family devotions. Men's Prayer Journal from Val Marie Paper. ESV Double Column Journaling Bible from WTS Books. Such a great way to encourage the men in your life to leave a legacy of God's Word to your family. These bible marking pens are a favorite too! The Radical Book for Kids: Exploring the Roots and Shoots of Faith by Champ Thornton. This is a great devotional tool for families and teens will love the book to read on their own too. Packed full of great biblical truth. A Hearty Manly Mug from Alewine Pottery. This is a favorite pottery stop for us in Gatlinburg whenever we stop. Sho the site and you may find some unique gifts for others on your list too. Subscription to Tabletalk Magazine from Ligonier. Any of the Children Books from The Good Book Company. I buy every book they come out with for my grand babies. Such solid resources and I love reading them too! I just ordered for them The Littlest Watchmen book and The Littlest Watchmen Advent Calendar for this year. Any of the Children's Books by R.C. Sproul from Ligonier. These will be loved for generations in your family. I've linked to their main page for children's resources so you need to look through them to find R.C. Sproul's books for kids. What God Wants for Christmas from Family Life Today. The three evangelistic books listed below are all from The Good Book Company and are great to give out to friends and family. You can add a homemade baked good (or chocolate) and a gift certificate to a favorite store or restaurant and tuck in the Good News of The Gospel! Another great option to tuck in a gift from a friend or family is The Biggest Question – Why? DVD from Wretched Radio. My friend Denise's family gave us a great idea last year to share Christ as we're running errands. They buy an outreach book (like one listed above – we're using Rescuing Christmas this year) in a larger quantity, wrap them and keep them handy to wish a Merry Christmas to anyone they encounter. It's a simple way to hand out the truth of Jesus and the receiver loves getting a wrapped gift (who doesn't?). The gift is well received by all and we haven't had one gift denied. Those are some of the items on my list for this year. What are some eternal focused gift ideas you love to give to family and friends? Please share with us here in the comments below! Hello! I’ve been following your blog for a couple of months now and really enjoying it. Thanks for compiling this list. I think I’m going to have to get myself that recipe journal for Christmas! It looks amazing. Jane, I love the journal and just updated it after Thanksgiving. Lots of room for notes and memories too :).